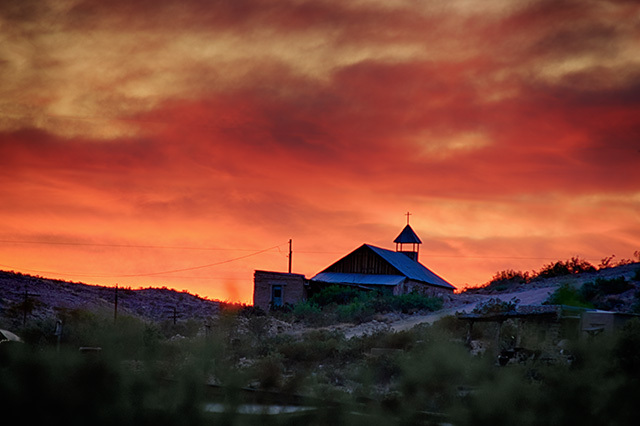 Partly cloudy skies gave us a beautiful sunset and this image of Santa Inez miners church on the hill to the west of our miners ruin in Terlingua. I wasn't able to get enough data for any pretty deep sky astrophotography, but I did enough to have confidence that my problems the other night were due to the wind. The little Vixen Polarie mount handled the big 300mm lens perfectly. I also discovered an longitude adjustment error I was making in polar alignment that will help in the future. This is a 5 stop/5 image HDR composite taken in Terlingua, Texas, at 2019-04-05 02:27 UT (8:27 CDT 4/4). Sony a6300 with Nikkor 300mm ED vintage lens. ISO 125, f/8, 1/5 - 1/80 sec exposures. HDR compositing, and exposure adjustment in Photoshop.